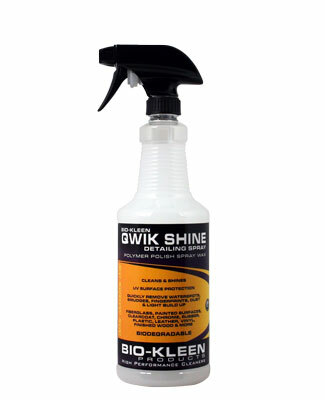 Biokleen Qwik Shine is a biodegradable, non toxic Liquid Spray Wax Detailing Spray for boats, rv, cars and trucks. A easy way to quickly remove dust, smudges, bird hits and water spots while maintaining a brilliant shine on your boat, rv, car or truck. A spray on, wipe off detailing formula that cleans and shines; giving you all of the gloss and protection of a wax in a fraction of the time. Enhances the depth of shine while adding a micro layer of polymer protection, creating a static free surface. Can also be used for boat, rv, car interior; giving you shine and UV protection without a the heavy sheen. Deters water, dust, dirt, airborne pollutants and stains from the finish of your boat, rv, car or truck. Watch the water bead up and roll off. No streaking and no rinsing for a Qwik Shine every time. Use on all boat, RV and automobile fiberglass, paints, clearcoat, metals, chrome, exterior trim, moldings, vinyl, leather, rubber, plastic, counters, interiors, dash and finished wood.